The event is one of the more interesting of the seasons as it reverts to what we normally see in mainstream sports, teams representing their country or region. A common complaint about Esports is the lack of a clear team to support, with many choosing to follow players instead. This format makes amends to the issue of not having a team to follow but puts limits on teams being able to have the best player available to them globally, somewhat lowering the playing standard. Spectators can instead cheer for their national team, or nation representing their region. Boasting an impressive $890,000 prize pool for the main stage, the event is sold as the unofficial world cup of Dota. The group stages will be played on the 7th- 8th of March where 4 groups of 6 teams play best of 2 round robins. The top 2 teams from each group advance to the playoffs, and the rest are eliminated. The playoffs are played on the 9th- 10th of March in a single elimination format, with all games being played best of 3 including the grand finals. The competition will be played on the recently released patch 7.21c. 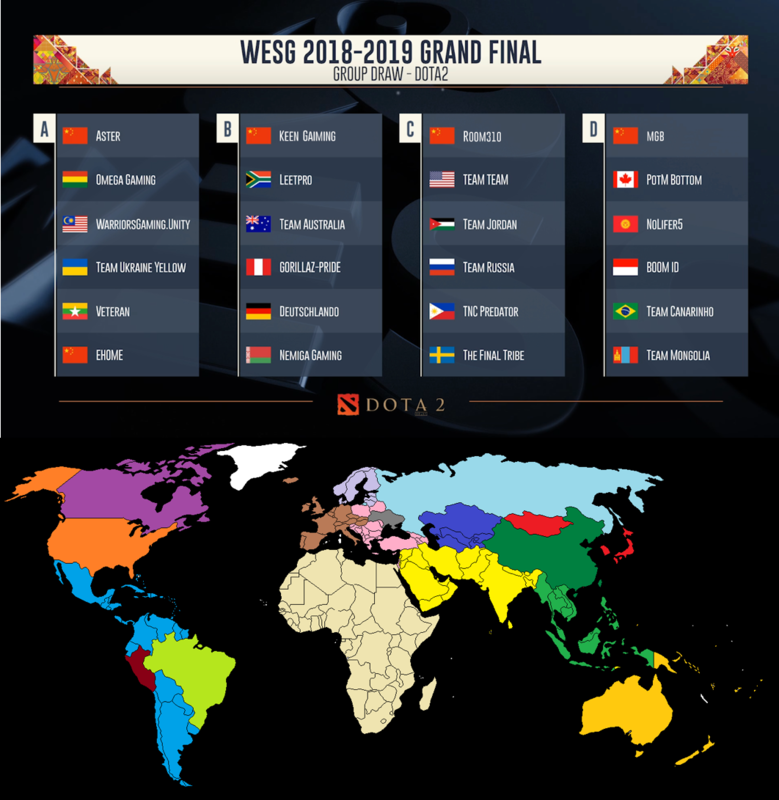 The lack of any real major competitions since its release will make WESG a trend setter for the new patch. While 7.21c was mainly addressing meta heroes and probably won’t change the macro game, it should give new options for teams to play around with. As teams are restricted to a single nationality, and with most of the top teams being multinational, many top players have chosen not to represent their nation. With the impending Dota Pro Circuit major DreamLeague 11, many players would rather spend their time boot camping. Canada, USA, Peru, Brazil, Ukraine, Russia, and China all had their own qualifier spot. The South East Asia region were given 4 spots. Everyone else received 1 qualifier spot. The 4 Chinese teams heading the groups were all directly invited. The world map colours denote the different qualifier regions. BOOM ID have since dropped out, being replaced by MEGA Aorus, a Vietnam team. Due to the nature of the Olympic format, teams rarely contain players that they normally would. It’s difficult to judge how teams will perform because, for a lot of the teams, this is the only tournament they play together. The thing to look out for in the teams is whether any players play together in the regular season, and the quality of their normal teams. The main exception to this is the Chinese teams, who rarely mix nationalities due to cultural/language differences and the Chinese scene being very inwardly focused. The qualifiers generally also lack insight into expected performance because of how shallow some of them are. Containing 4 of the players from Virtus.Pro and Gambits midlaner along with being the defending champions, Team Russia is my favourite to take out the competition. Coached by the legendary "Xiao8", I’d consider them the strongest Chinese team in WESG. They managed to win the Bucharest Minor, took a surprising 5th-6th in the Chongqing Major and qualified for the Dreamleague Major. They did however have a weak performance at MDL Macau, bottoming the groups and getting knocked out 1st round. The weak recent performance can be attributed to one of their key players ("Faith_Bian") breaking his arm. I cannot really consider them favourite because of the loss of "Faith_Bian", but they are still in contention. They came second place at the last WESG and have 3 players from Chaos Gaming who had a good group stage but poor playoff performance at ESL One Katowice. The Brazilian teams are always ones to watch due to the tight knit region and their cohesion. The team contains players that have all performed at the highest level for extended periods of time. They include players like Virtus.pros midlaner "Noone" and ex-Navi "General". However, they lack cohesion and some of the players haven’t played at the highest level in a while. KG has won the JJB spring cup convincingly after dropping only one game. They have also won spots at ESL One Mumbai and the Dreamleuage major. Keen have looked good in China against solid teams. They should have no issue competing against any of the teams present at WESG. TNC play together throughout the season, playing second fiddle in the SEA region to Fnatic. Their captain has however been banned from China, so they’re coming into this with 2 new players. After winning the 2016 WESG championship, they remain a strong competitor, but much remains ambiguous about their performance without their captain. Aster have very much struggled in the new year despite having some of the best players China has to offer. A mediocre performance at ESL One Katowice, only managing to beat the weaker teams in groups and getting knocked out in the first round by OG. Failed to qualify for both the Dreamleague major and the Starladder minor. They’re currently in a big slump, even in local competitions. Housing the International 8 winner "Ana", the team hosts the best Australian talent on offer, including another international star "QO". Generally, the mark of a good Australian player is moving to a different region to compete. "Velo" has recently moved to SEA, but "Godot" and "Xemistry" still primarily play in Australia. This could cause issues, due to their lack of exposure to strong international players. A Swedish team that once had reasonable success. The immense competition in the EU region has seen them struggle to make a mark, hitting a string of disappointments. The players have played together for some time and have international experience, but they have always felt like a high skill pub stack to me. Nevertheless, they have the tools to play at a high level, they just have to work out how to use them.